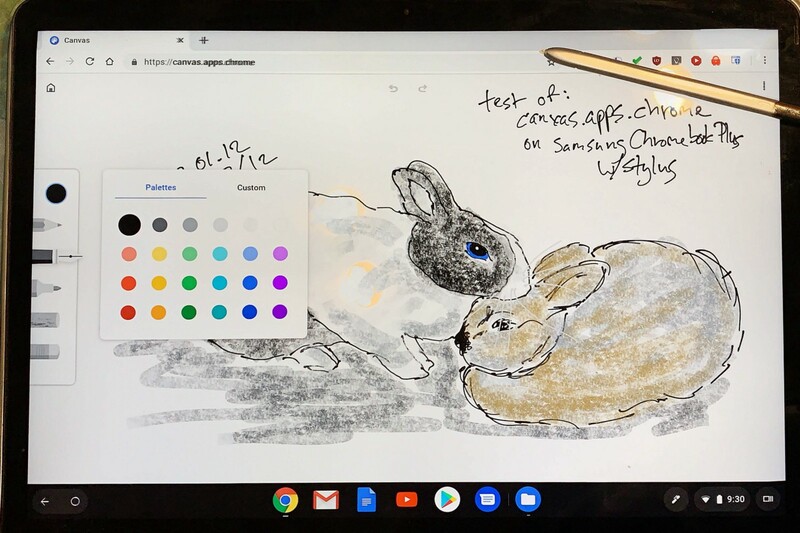 For this test, I used the the Chromebook I use every day: The 2017 Samsung Chromebook Plus which has a touchscreen and includes a stylus. The Canvas web app is very basic. There’s no layers that I can find. It has, however, a very deep undo. I was able to undo several dozens marks when I decided to switch from cross hatches to a charcoal drawing tool. Speaking of charcoal, the drawing tools available are: Pencil, pen, marker pen, charcoal and eraser. There’s a decent color palette and colors can be customized. There’s an export option available from the drawing canvas. However, it doesn’t seem to work. You can, however, export the drawing from the gallery level. The drawing itself is stored in the cloud and associated to your Google account. This lets you access it from any device with a Chrome browser (I haven’t tried to access it from other browsers). Chrome Canvas isn’t my first choice for my daily doodle project. But, if all I had was a Chrome browser on a touchscreen enabled device, I would use it to keep to doodle streak going.